I love chili. I love beans in my chili. But I like my homemade chili more than the watery version of some restaurants in the metro. I have been making chili for as long as I can remember, but I always opted for the prepared beans since dried beans generally take too long. One day while eating out at Chilis, I discover that my sister likes chili con carne too! I remember always being the only person to eat this at home. And she said that she likes it ala refried beans, not the beany version. I had some dried pinto beans at home and decided to try/slightly attempt the refried beans. I made a shortcut but anyway. Let me go on. I boiled some pinto beans, and allowed to soak this in the hot water,and let this soften. I drained and boiled it a second time after a few hours of soaking to a tender tooth. I then mashed it, along with the little boiling water it had left, to a grainy mush. Ideally, this would be cooked down already, treat it like chili, cooked with tomatoes, some seasoning and spices. Instead, i added this directly to the browned beef, which I had seasoned with spices, salt, and cooked down with tomatoes and broth. 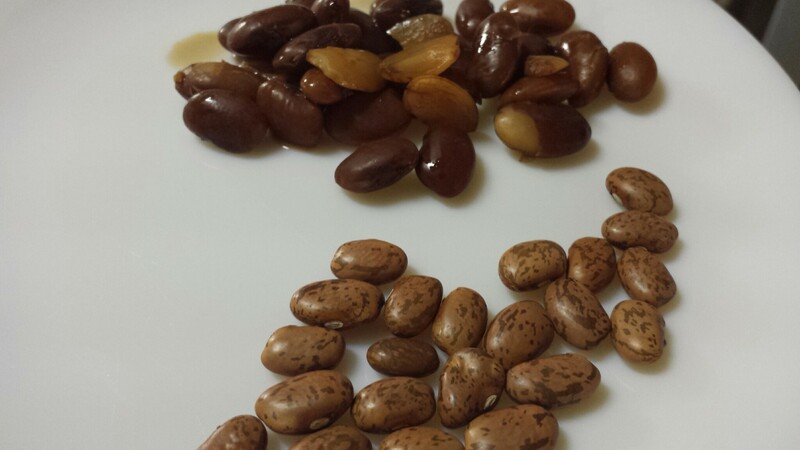 I am happy to experiment with pinto beans, the first time to do so. But I really need to find other uses for this healthful foods. I keep seeing refried beans, and that’s about it, really. So boo. Boil the beans in the water, and turn off heat, and allow to soak for a couple of hours. After a few hours, throw away the water and replace with new water. Boil again, and this time for about an hour. Mash the beans, or put in a blender, to your taste. Set aside.